At least 30 pro-Russia separatists have been killed so far during clashes with Ukrainian forces at the Sergei Prokofiev Airport in the eastern city of Donetsk, insurgents say. Armed separatists tried to take over the airport on Monday. Ukraine’s newly elected President Petro Poroshenko vowed on Monday “anti-terrorist operations” in the east would “last hours not months”. 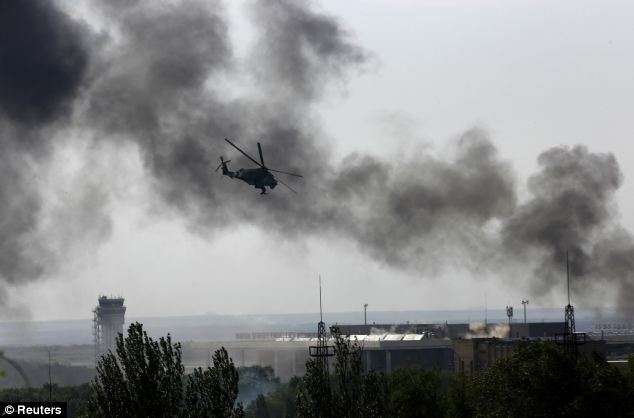 One insurgent told Associated Press the bodies had been brought to a hospital in Donetsk. Interior Minister Arsen Avakov said there were no casualties among Ukrainian troops. Monday’s clashes started after separatist militants stormed the Sergei Prokofiev Donetsk airport in the early hours of the morning. The Ukrainian military responded quickly with air strikes and an assault by heavily armed troops. Reporters said there was heavy gunfire throughout the day and night, with black smoke rising into the air. The attempt to seize the airport may have been intended to prevent Petro Poroshenko from travelling there after he said his first trip in office would be to visit the restive east. Petro Poroshenko, a 48-year-old billionaire and former foreign minister, was on Monday formally declared the winner of Sunday’s presidential election with 54% of the vote. However, President Petro Poroshenko has also said he wants to talk to Russia to end the crisis. Russia’s Foreign Minister Sergei Lavrov said Moscow was “open to dialogue” with Petro Poroshenko but insisted that military action against separatists must end.